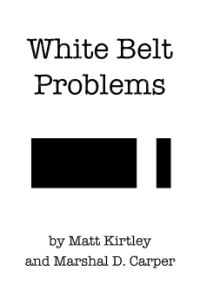 Home » White Belt Problems » What am I supposed to do when I spar? What am I supposed to do when I spar? If you think the answer is “win,” you are wrong. When you spar, you are supposed to learn. That is your ultimate and constant goal. If you make sparring, or rolling as we usually call it in Brazilian Jiu-Jitsu, about winning and losing, you are missing the greatest learning opportunities you will ever have. The most productive rolls tend to be the ones that are driven by an objective. For example, your objective could be to work on arm drags, or to work on back control escapes, or to work on that one new guard pass. In this way, rolling becomes an experiment. You learn from success, and you learn more from failure. You see what works, what doesn’t, and begin to catalogue the various reactions you might see in attempting a particular technique. Of course, this means more than just rolling blindly. It means being mindful and observant. Otherwise, you will end the roll and have no idea of what happened. Even free roll, when the goal is actually to tap out your partner, you are still conducting an experiment, the net is just cast a bit wider. In this scenario, you are evaluating the whole of your game—how the pieces connect, what parts are strongest, what parts are weakest, and what facets could be just a bit sharper. When your only goal is to “win,” you eventually lose because your jiu-jitsu will not evolve.